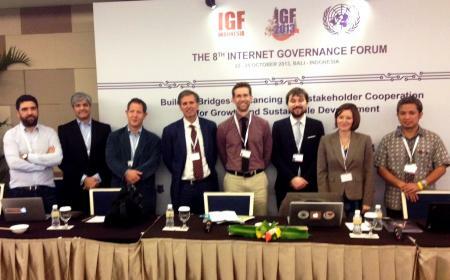 The panel was held at the 2013 Internet Governance Forum with Claudio Ruiz of Derechos Digitales, Zahid Jamil of the CSPA, John Kampfner of the Global Network Initiative, Scott Busby of the U.S. Department of State, Ross Young of Google, Mike Harris of Index on Censorship, and Donny B.U. of ICT Watch. A lively discussion took place on government responsibility, corporate accountability and current challenges.